I have seen many of these boxes hung outside a stall in the basement of Hougang Mall. This stall sells Tea Eggs, Corn Cup and Dumplings. 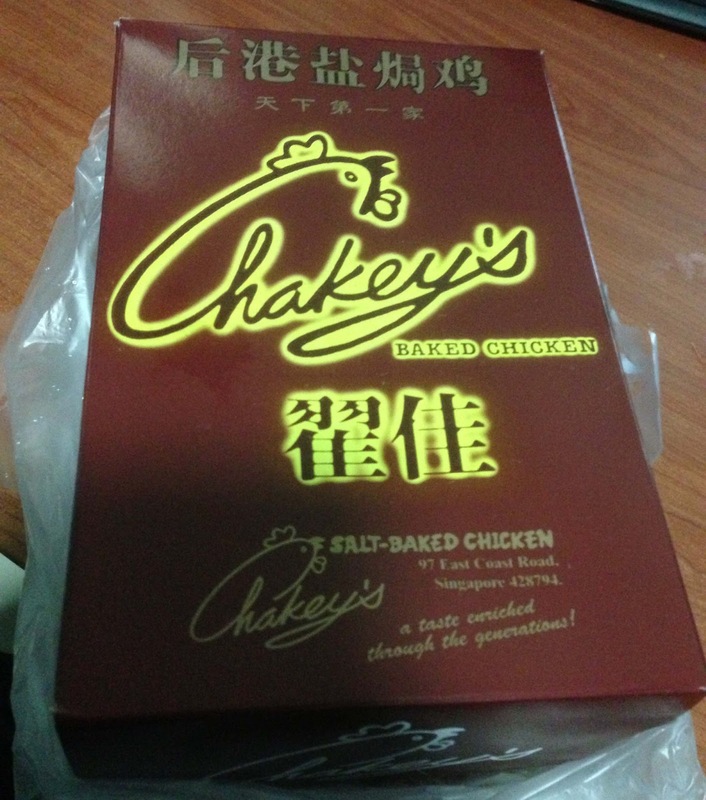 Besides that, the stall also sells Chakey's Baked Chicken. When you visit the stall and see the box, you may be intrigue by the phrase "Salted-Baked Chicken". 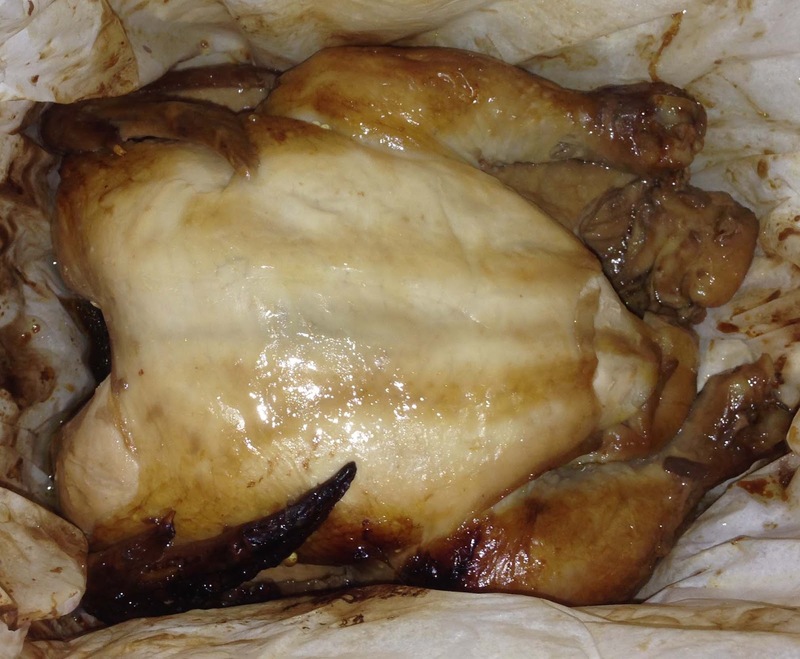 You cannot see the chicken as it is wrapped up like a mummy and placed in the food warmer. I have given it a miss as the box does not look attractive, and the way they wrap the chicken is not appealing to me. 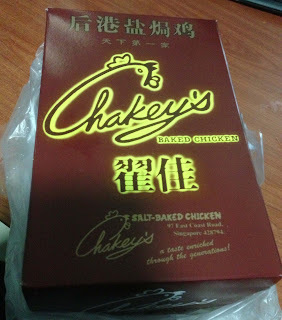 However, I was informed by one of my friends that Chakey's Salted-Baked Chicken is very famous. In Junction 8, it will be sold out by late evening. This leads me to try buying one from the Hougang Mall. This is how the chicken looks like when I removed the wrapper. It is still warm, and it does smell good. It seems to me that the chicken has been cooked for a long time, and just a little pull, you would be able to remove the wings and drumsticks for consumption. You can basically tear the chicken apart without much effort. After taking a bite, I was surprised that this chicken is well-cooked. The meat is tender and soft. The gravy is trapped in the meat, and you would find the meat delicious and juicy. It has a light herbal taste and not really salty at all. I would say that the chef making this dish puts in just the right amount of ingredients and spices to perfect the taste. I would recommend any foodies who likes to eat soft and tender chicken meat to try out this dish. It costs less than $20 and a good dish to be served during your meals. Forget about going to Bishan Junction 8 basement to buy this chicken. Come to Hougang Mall basement and you can find the shop next to the escalator. The lesson I learnt here is "Don''t judge a chicken by its box". Next, I would share with you my favourite pizza at a very special pizza restaurant. Do come back for it. chef does not 'make' dish. He prepares. I'm a chef and a native English speaker; I "make" food every day. Calm down.